(91outcomes.blogspot.com) -- The Institute of Medicine (IOM), part of the National Academies of Science, published an extensive series of medical reviews on deployment health of our veterans of the U.S. Armed Forces. Among those is one from IOM's series on WWII veterans, published shortly after the 1991 Gulf War, entitled, "The Health Effects of Mustard Gas and Lewisite: Veterans at Risk," (1993). For many Americans, this would seem like the stuff of science fiction. However, it's not necessarily so for veterans of the 1991 Gulf War and other veterans affected by chemical warfare agent exposures followed by decades of official denial. World War II (WWII) has been called “the unfought chemical war.” Both sides had produced millions of tons of chemical weapons and had made massive preparations for their use, yet the weapons were never used. These preparations included the establishment of secret research programs to develop better weapons and better methods of protecting against those weapons. By the time the war ended, over 60,0000 U.S. servicemen had been used as human subjects in this chemical defense research program, in a wide range of exposures from mild to quite severe. All those undergoing the latter exposure. and some undergoing the former were told at the time that they should never reveal the nature of the experiments. Almost to a man, they kept this secret for the next 40 years. Public attention was drawn to these experiments when some of the WWII human subjects began to seek compensation from the Department of Veterans Affairs (VA) for health problems that they believed were caused by their exposures to mustard agents or Lewisite. Resolution of these cases was complicated by a lack of records documenting individual participation in the experiments, and uncertainty as to which health problems were in fact the result of these exposures. In June 1991 [just over three months after the end of the 1991 Persian Gulf War] the VA announced guidelines for the handling of these cases, including the loosening of normal requirements for documenting individual participation in the experiments, and the identification of seven diseases to be considered as caused by mustard agents or Lewisite. In addition, the VA requested that the Institute of Medicine (IOM) convene a committee to assess the strength of association between exposure to these agents and the development of specific diseases. The committee was also charged with identifying the gaps in the literature, and making recommendations as to closing them. The lack of follow-up health assessments of the human subjects in the WWII gas chamber and field tests severely diminished the amount and quality of information that could be applied in the assessment of long-term health consequences of exposure to mustard agents and Lewisite. The levels of exposure to mustard agents and Lewisite may have been much higher than inferred in the summaries of the gas chamber and field tests. There were no epidemiologic studies done of mustard-agent exposed U.S. chemical weapons productions workers, war gas handlers and trainers, or combat casualties from WWII. The lack of follow-up of exposed WWII veteran "volunteers," the identified possibility that levels of exposure may have been higher, and the lack of epidemiological studies on those exposed are troubling. Yet, decades later, responsible federal officials at DOD and VA failed in these same areas with veterans of the 1991 Gulf War. The timing of the 1993 publication of this material is of note -- nearly 50 years after the fact, but just two years after the Gulf War, the veterans of which had already begun to complain of mysterious symptoms. 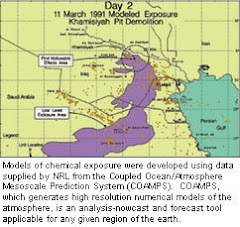 Mass exposures of Gulf War troops to sarin and cyclosarin have already been proven with the Khamisiyah incident in which a bunker complex filled with chemical munitions was detonated, resulting in a chemical plume that drifted over a wide swath of troop areas for at least three days. Lesser known is the fact that mustard blister agent was also part of the Khamisiyah detonation. Given that the Iraqi military had forward deployed mustard to Khamisiyah, and given the history of Iraq's offensive use of mustard, lewisite, and mustard-lewisite mixtures during the Iran-Iraq war, it should be assumed that Gulf War troops were exposed to mustard and/or lewisite vapors -- which would certainly explain many Gulf War veterans' commonly reported symptoms. In fact, DOD admitted to "one" mustard gas exposures in a 1997 press release, entitled, "Mustard Gas Exposure Likely, report finds." 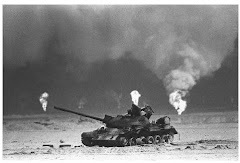 And IOM noted that Gulf War veterans who were Khamisiyah "witnesses" were highly likely to report that they recalled several symptoms of mustard agent exposure, including coarse voice, rash, and blisters. Two other storage sites in central Iraq, Muhammadiyat and Al Muthanna, sustained damage from air attacks during the Gulf War. Munitions containing 2.9 metric tons of sarin–cyclosarin and 1.5 metric tons of mustard gas were damaged at Muhammadiyat, and munitions containing 16.8 metric tons of sarin–cyclosarin were damaged at Al Muthanna (PAC 1996a). It is time for Congress to conclude that Gulf War troops were exposed to not only sarin and cyclosarin, DU, and the full range of pesticides and PB pills, but also mustard and lewisite blister agents -- and to provide presumptive service-connection to ensure VA healthcare for the range of known health outcomes from these exposures.